WARN THE CITIES NOW—There is no change in the messages that God has sent in the past. The work in the cities is the essential work for this time. When the cities are worked as God would have them, the result will be the setting in operation of a mighty movement such as we have not yet witnessed. . . As a people we are not half awake to a sense of our necessities and to the times in which we live. Wake up the watchmen. Our first work should be to search our hearts, and to become reconverted. We have no time to lose upon unimportant issues. —Medical Ministry, p. 304. The spiritual darkness that covers the whole earth today, is intensified in the crowded cen­ters of population. It is in the cities of the na­tions that the gospel worker finds the greatest impenitence and the greatest need. . . . God is now calling upon His messengers in no uncer­tain terms to warn the cities while mercy still lingers.—Evangelism, pp. 25, 26. TOTAL EVANGELISM REQUIRED—The conver­sion of souls is now to be our one object. Every facility for the advancement of God’s cause is to be put into use.—Medical Ministry, p. 328. Some will be attracted by one phase of the gospel, and some by another. We are instructed by our Lord to work in such a way that all classes will be reached.—Ibid., p. 327. We do not realize the extent to which sa­tanic agencies are at work in these large cities. The work of bringing the message of present truth before the people is becoming more and more difficult. It is essential that new and varied talents unite in intelligent labor for the peo­ple.—Evangelism, p. 31. JESUS THE EVANGELIST—Some ministers make the mistake of supposing that success depends on drawing a large congregation by outward display, and then delivering the message of truth in a theatrical style. But this is using com­mon fire instead of the sacred fire of God’s kin­dling. The Lord is not glorified by this manner of working. Not by startling notices and ex­pensive display is His work to be carried to completion, but by following Christlike meth­ods. ‘Not by might, nor by power, but by My Spirit, saith the Lord of hosts [Zech. 4:6].—Gospel Workers, p. 383. Christ’s method alone will give true success in reaching the people. . . . There is need of coming close to the people by personal effort. If less time were given to sermonizing and more time were spent in personal ministry, greater results would be seen. The poor are to be re­lieved, the sick cared for, the sorrowing and the bereaved comforted, the ignorant in­structed, the inexperienced counseled. We are to weep with those that weep, and rejoice with those that rejoice. Accompanied by the power of persuasion, the power of prayer, the power of the love of God, this work will not, cannot, be without fruit.—Ibid., p. 363. OUR APPOINTED METHOD—The medical mis­sionary work is a door through which the truth is to find entrance to many homes in the cities. —Evangelism, p. 533. 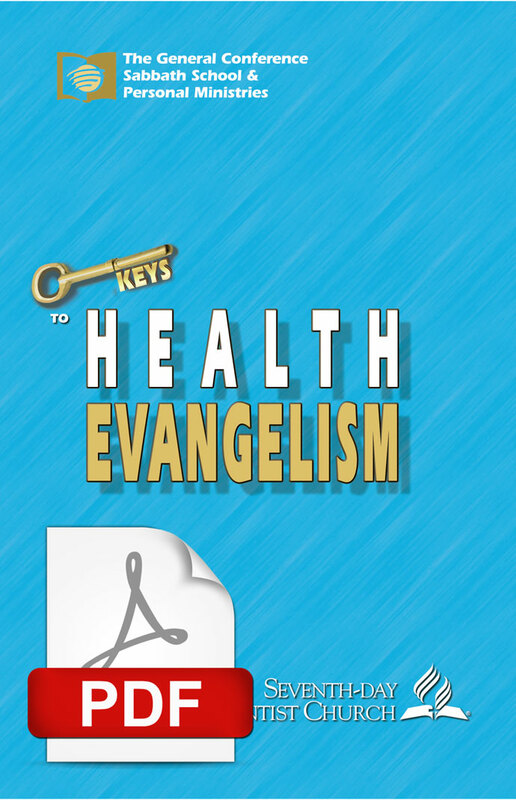 The gospel ministry is needed to give per­manence and stability to the medical mission­ary work; and the ministry needs the medical missionary work to demonstrate the practical working of the gospel. Neither part of the work is complete without the other.—Counsels on Health, p. 514. DOWNTOWN CENTERS—Centers of influence may be established in many places by the open­ing up of health food stores, hygienic restau­rants, and treatment rooms.—Testimonies, vol. 7, p. 234. In every important place there should be a depository for publications. And someone who really appreciates the truth should manifest an interest to get these hooks into the hands of all who will read.—Christian Service. p. 154. 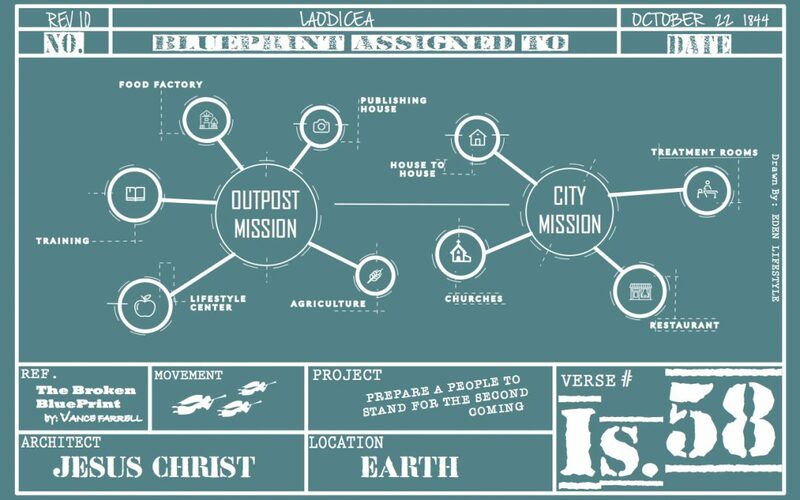 In connection with our city missions, there should be suitable rooms where those in whom an interest has been awakened can be gathered for instruction. This necessary work is not to be carried on in such a meager way that an un­favorable impression will be made on the minds of the people. All that is done .. . should prop­erly represent the sacredness and importance of the truths of the third angel’s message.—Gos­pel Workers, pp. 347, 348. HOUSE TO HOUSE—Of equal importance with public effort is house-to-house work in the homes of the people.—Ibid., p. 364. For years I have been shown that house-to­-house labor is the work that will make the preaching of the Word a success.—Evangelism, p. 433. In almost every community there are large numbers who do not attend any religious serv­ice. If they are reached by the gospel it must be carried to their homes.—Medical Ministry, p. 246. FOOD, HEALTH, TEMPERANCE—Wherever the truth is carried, instruction should be given in regard to the preparation of wholesome foods. God desires that in every place the people shall be taught by skillful teachers how to utilize wisely the products that they can raise or readily obtain in their section of the country. Thus the poor, as well as those in better circum­stances, can be taught to live healthfully.— Gospel Workers, p. 233. The people need to see the bearing of health principles upon their well-being, both for this life and the life to come. They need to be awakened to their responsibility for the human habitation fitted up by their Creator as His dwelling place, and over which He desires them to be faithful stewards.—Evangelism, p. 525. When temperance is presented as a part of the gospel, many will see their need of reform. . . . As this instruction is given, the people will become interested in other lines of Bible study. As we near the close of time, we must rise higher and still higher on the question of health reform and Christian temperance, presenting it in a more positive and decided manner.—Call to Medical Evangelism, pp. 41, 42. WELFARE WORK—The Poor and Outcasts.—Poverty and distress in families will come to our knowledge, and afflicted and suffering ones will have to be relieved. We know very little of the human suffering that exists everywhere about us, but as we have opportunity we should be ready to render immediate assistance to those who are under a severe pressure.—Wel­fare Ministry, p. 137. Christ preached the gospel to the poor, but He did not confine His labors to this class. . . . We are not to strain every spiritual sinew and nerve to work for the lowest classes, and make that work the all in all. The work of seeking the outcasts is important, but it is not to be­come the great burden of our mission.—Medi­cal Ministry, p. 312. THE INFLUENTIAL AND SOCIAL GROUPS— Great men, learned men, can be reached better by the simplicity of a godly life than by all the sharp arguments that may be poured upon them.—Evangelism, p. 557. Those who belong to the higher ranks of society are to be sought out with tender affec­tion and brotherly regard.—Ibid., p. 555. Many in high social positions are heart sore, and sick of vanity. They are longing for a peace which they have not. In the very highest ranks of society are those who are hungering and thirsting for salvation. Many would receive help if the Lord’s workers would approach them personally, with a kind manner, a heart made tender by the love of Christ.—Christ’s Object Lessons, p. 231. It requires money to carry the message of warning to the cities. It is sometimes necessary to hire at large expense the most popular halls, in order that we may call the people out. Then we can give them Bible evidence of the truth.—Evangelism, p. 75. VARIED TALENTS NEEDED—God is calling not only upon ministers, but also upon physicians, nurses, colporteurs, Bible workers, and other consecrated laymen of varied talent who have a knowledge of the Word of God and who know the power of His grace, to consider the needs of the unwarned cities. Time is rapidly passing, and there is much to be done. Every agency must be set in operation, that present opportu­nities may be wisely improved.—Ibid., p. 533. FINANCIAL RESOURCES—The means in our possession may not seem to be sufficient for the work, but if we will move forward in faith, be­lieving in the all-sufficient power of God, abundant resources will open before us. . . . If we go to the Source of all strength, with our hands of faith outstretched to receive, we shall be sustained in our work, even under the most forbidding circumstances, and shall be enabled to give to others the bread of life.—Welfare Ministry, pp. 265, 266. God’s people are not to go forward blindly in the investment of means that they have not and know not where to obtain. . . . Before they begin to carry out their plans, they must advise with wise counselors.—Evangelism, p. 85. SANITARIUMS NEAR THE CITIES—There should be sanitariums near all our large cities.—Medi­cal Ministry, p. 324. In every city there are men and women who would go to a sanitarium were it near at hand, who would not be able to go to one a long way off.—Ibid., p. 325. DUTIES OF OUR LAYMEN—Those who have the spiritual oversight of the church should de­vise ways and means by which an opportunity may be given to every member of the church to act some part in God’s work. . . . In their planning they are to give special study to the work that can be done by the laity for their friends and neighbors.—Gospel Workers, pp. 351, 352.